First-time charter clients often step aboard my flats boat and ask why I don’t have a trolling motor. “Because I know that will always start,” I tell them, pointing at my 22-foot push pole. Trolling motors are more dependable than ever, but in the shallow depths I typically target, a push pole is still the best tool when stalking wary fish. 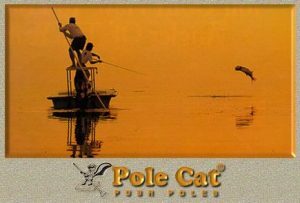 PoleCat Push poles are the strongest, stiffest, wrapped fibreglass, and graphite poles available, with several choices of points and foots. Machined points and foots are guaranteed for life of the pole. Poles weigh less than seven pounds. Fibreglass poles are a natural color; graphites are charcoal/black. Poles are extra stiff to maximize poling performance. Poles are available in any length up to 19′. Poles and accessories are in stock for immediate shipment. Extensive line of accessories. Inc.